The previous header photo was of South African Jack Koper's Dabchick scow, a junior trainer that was Koper's first design, done in 1955. Designed as a simple home-build project, the Dabchick still remains a popular junior trainer in South Africa. It is somewhat unique among current singlehanders, being a sit-on-top design (no cockpit) and having a sloop rig instead of the normal cat rig. 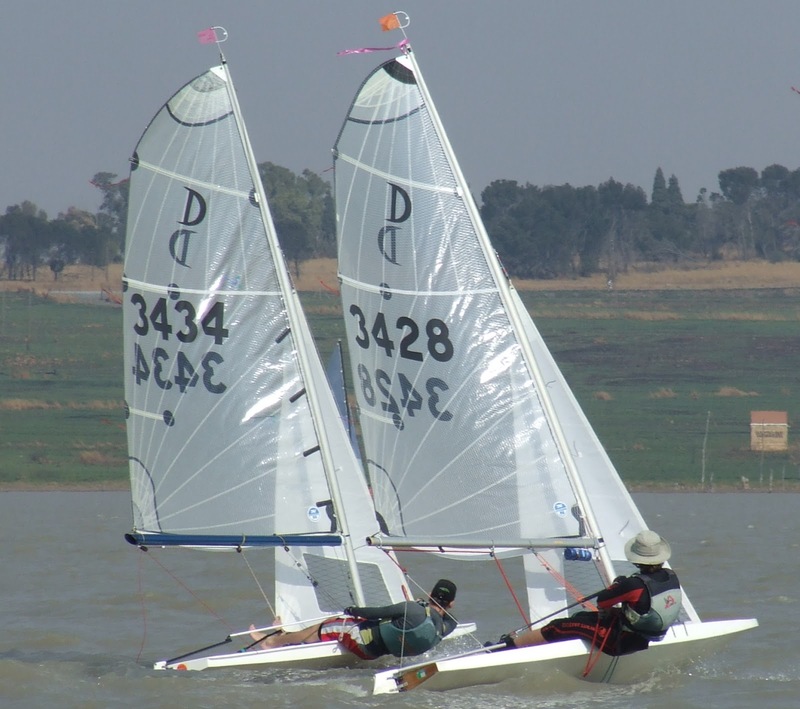 Jack Koper's two other scow designs have been profiled in previous Earwigoagin posts and his two man Sonnet scow also has a sizeable following in South Africa. Modern research tells us that flat leg hiking is supposedly the most ergonomic way to hike. There is no other way to hike but to hike with flat legs in a Dabchick. A modern racing glass Dabchick. Plenty of controls here for the dedicated junior competitor. The Dabchick class has also bumped out the roach of the original mainsail and allowed mylar sail cloth. Joe over at the blog Horse's Mouth has also done an extended post on the Dabchick. 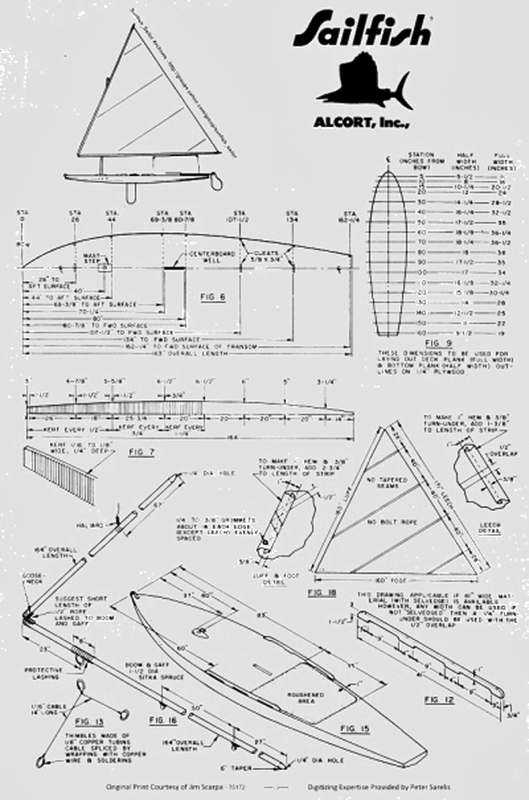 One of the early sit-on-tops was Crosby's Skimmer Moth designed in 1933, with plans published in The Rudder magazine. An example was recently uncovered by Yarrow Thorne in New England. I've always fancied this green for a deck color. The Alcort Sailfish is the sit-on-top most of us North American oldsters have encountered at some point, either having the unique experience of whooshing around on one or coming upon one on the beach. Designed in 1945 by Al Bryan and Cortlandt Heyniger, the Sailfish was originally offered as plans but then shortly their company, Alcort, offered the Sailfish as a kit. It was the right boat at the right time as there was a big DIY boat building boom in the post war years. 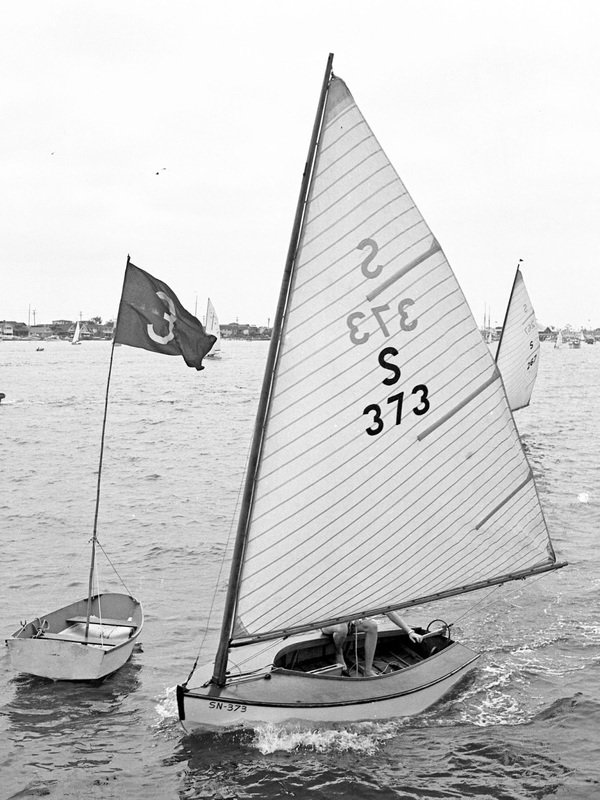 The Sailfish was eventually eclipsed by the bigger brother, the fiberglass Sunfish sporting a cockpit. 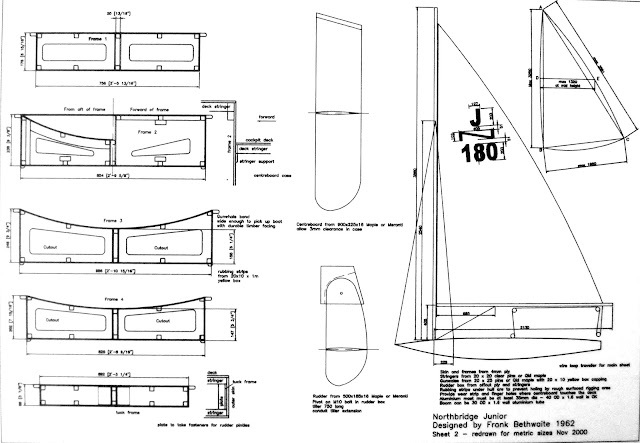 One of the sheet of plans for the Sailfish. 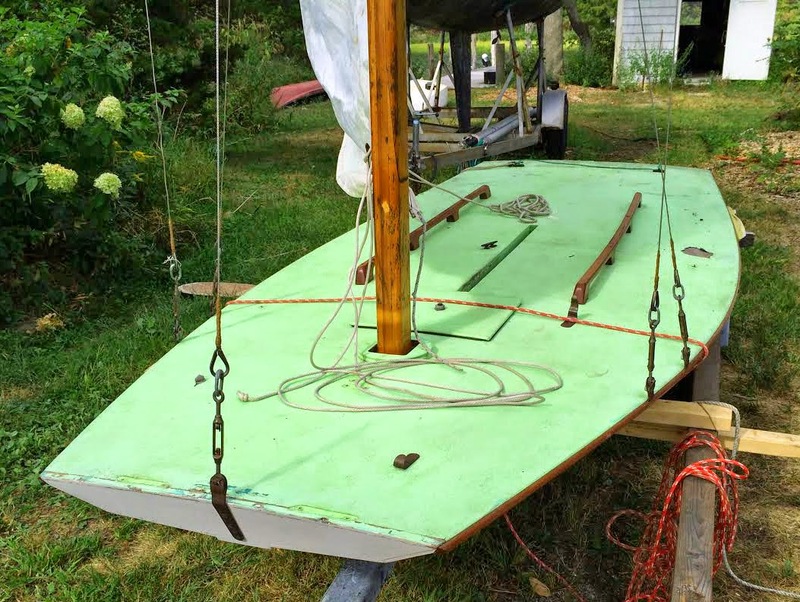 The history goes that English dinghy designer Ian Proctor was over for the 1958 America's Cup and was intrigued with the Alcort "beach boats" he saw sailing on the New England waters. He went back to England and designed his version of a sit-on-top, the flush decked Minisail Monaco scow, originally built in fiberglass. 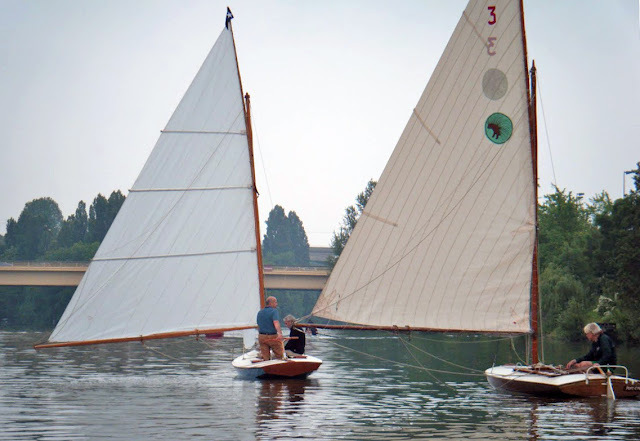 A plywood version, the Sprite scow, came out a short time later. The Minisail line grew, added cockpits and sliding seats and eventually continual development produced the well-known roto-molded Topper junior trainer (fun bit here and another fun bit here and the serious junior bit here). Renowned dinghy designer Frank Bethwaite's first design, in 1962, was a sit-on-top scow junior trainer for his kids, the Northbridge Junior. His sit-on-top featured a dished concave deck, not a convex deck and was only 2.44 meters long (8 feet). 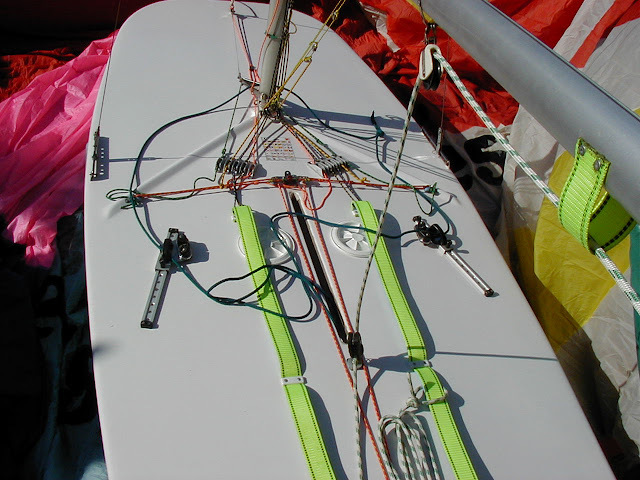 This photo shows a modern build with modern mylar rig and carbon mast. One sheet of the Northbridge Jr. plans that I found kicking about on the Internet. A Northbridge Junior build in Japan. There is also the Australian Sailfish scow sit-on-top. Here is a PDF of Australian Sailfish plans. 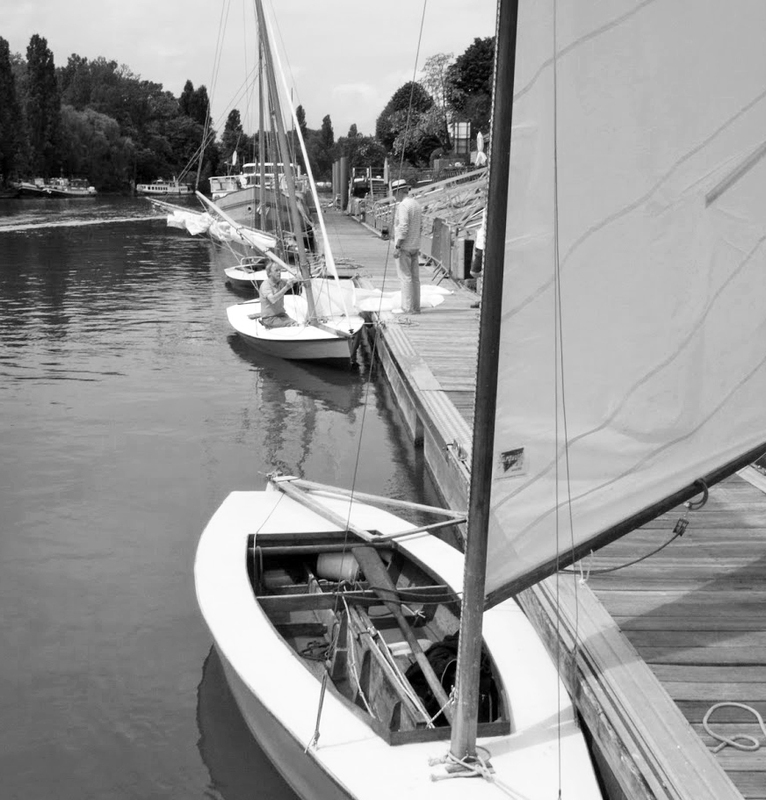 Bertrand Warion sent along some photos he took of the "Voiles des Boucles de la Marne" (rough translation - sailboats of the Loops of the Marne, a reference to the rough S shape of the Marne River on the southeastern suburbs of Paris). The "Voiles des Boucles de la Marne" was a small gathering, this past May, of traditional French small sailboats that were sailed on the rivers around Paris during the late 19th and early 20th centuries. Of interest was the plywood reproduction of the 1903 French 5.5 meter sailing dinghy, "Le Monotype de Nogent-Joinville". 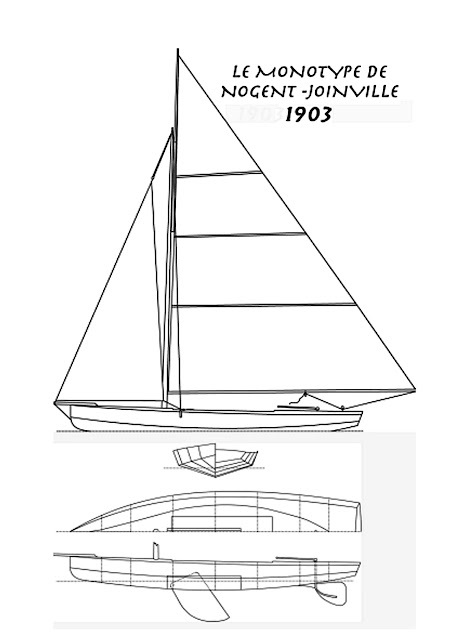 The Monotype de Nogent-Joinville was drawn up by Ernest Binet, following the detailed input of Albert Glandaz and was a product of a push by Parisian sailors, as they entered the twentieth century, to develop small one-design sailboats for racing (the French word "monotype", in this case, can be translated to mean one-design). The Monotype de Nogent-Joinville at the dock. Behind her is the Monotype de Chatou, the scow type which had appeared on the French rivers several years earlier in 1901. 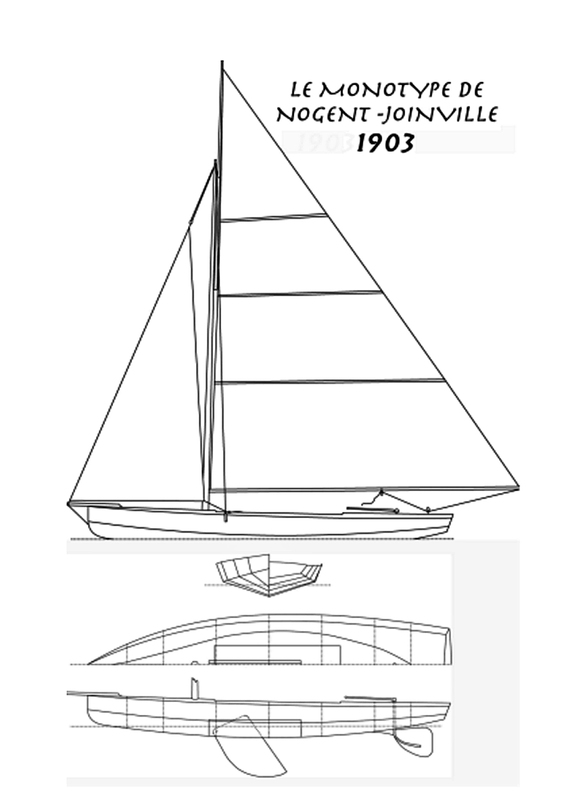 The Monotype de Nogent-Joinville has a deep vee hull. 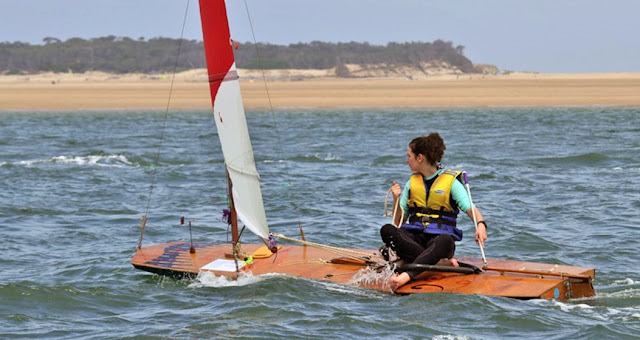 For river sailing, the wetted surface is much reduced compared to the flat Monotype de Chatou but the Monotype de Chatou would remain more popular, with around 140 being built compared to around 20 for the Monotype de Nogent-Joinville. Historian Louis Pillon put together the lines of the Monotoype de Nogent-Joinville from a magazine article of that period. The Monotype de Nogent-Joinville was a sloop, had a low slung gunter rig, the main had three full length battens. It is a rig that the French designers copied, according to Louis Pillon, from the English designer Linton Hope. 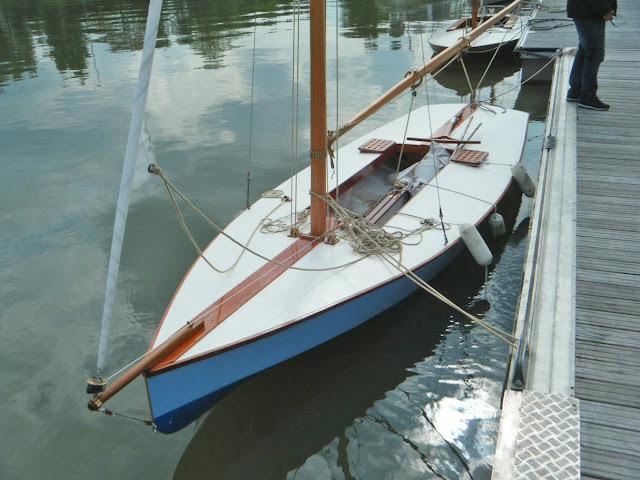 This reproduction was built by volunteers at Sequana, the French nautical historical society, under the direction of Bertrand Chazarenc. Out sailing; the Monotype de Nogent-Joinville drifting ahead of Louis Pillon's Monotype de Chatou. According to Bertrand, the Monotype de Chatou has bamboo spars! Another photo from the dock. In the foreground, with the cool wishbone-type split tiller, is Bertand Warion's Sharpie 9m2, a flat-bottomed, canoe-like French singlehander that was designed in 1937. 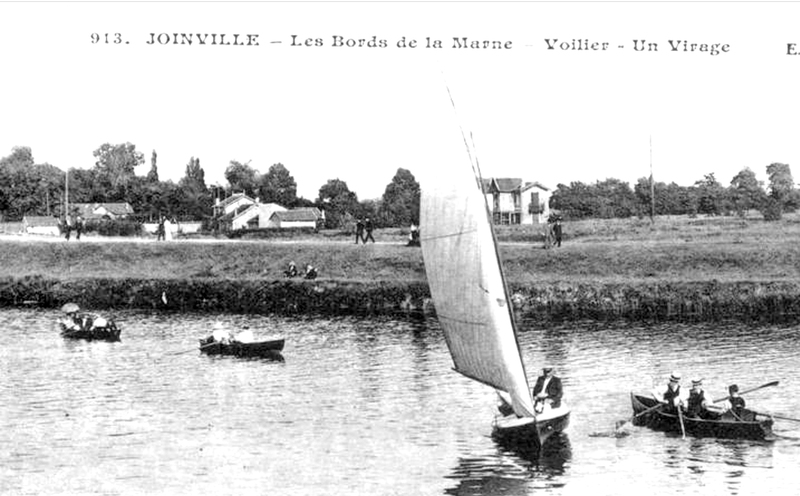 A contemporary postcard, early 1900's, with a Monotype de Nogent-Joinville sharing the river with various Sunday leisure rowboats. I have gleaned all of the history from Louis Pillon's articles which I found online. 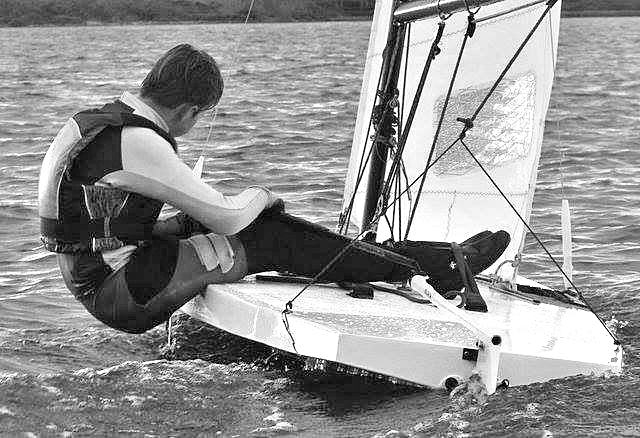 Segeln - in the Bathtub! I've had this video bookmarked for years. Time to put it up on Earwigoagin. An arresting (definitely arresting), ultimately humorous ad for the German Interboot boat show. Sailors will be sailors! Segeln from WORKFLOW FILMS on Vimeo. Neil Kennedy of New Zealand sent along some magazine snippets of the New Zealand Classic Skiff Moths, specifically from Seacraft magazine - 1958 and 1959, and Sea Spray magazine - 1965. 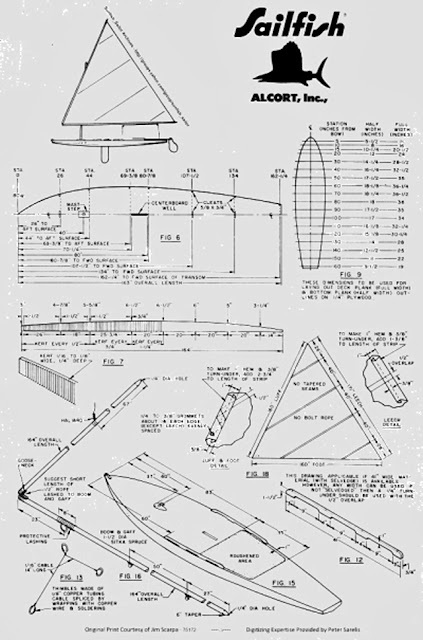 The 1958 cover of Seacraft has a Hawk design skiff with a rotating mast. Bruce Farr got his start mucking around with Moth designs. His Mark III model is shown in the 1965 issue of Sea Spray. I didn't realize he had a brother, Alan, that was also his compatriot in cooking up Moth designs. The Antipodean Moths always had a taller, fully battened sail plan compared to the American Mothboat. The previous header photo was of the fleet of 12' Snowbird dinghies making their way upwind in the "Flight of the Snowbirds", a one-race tour around Newport, California harbor. Held in August, the race usually attracted over 100 Snowbirds with the record topping out at 167 Snowbirds in 1957. 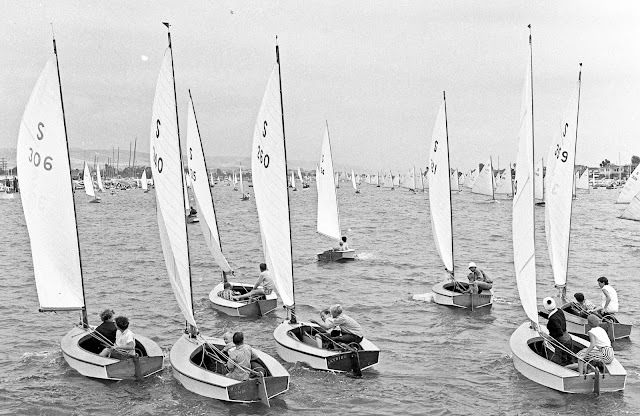 Over the Snowbird history, the class issued more than 500 numbers but, being primarily a junior boat, died out in the late 1960's as yacht clubs turned to smaller, lighter boats for their junior programs. The Snowbird first appeared as plans in the 1921 "The Rudder" magazine and by 1923 they were being built in Newport as a junior boat. 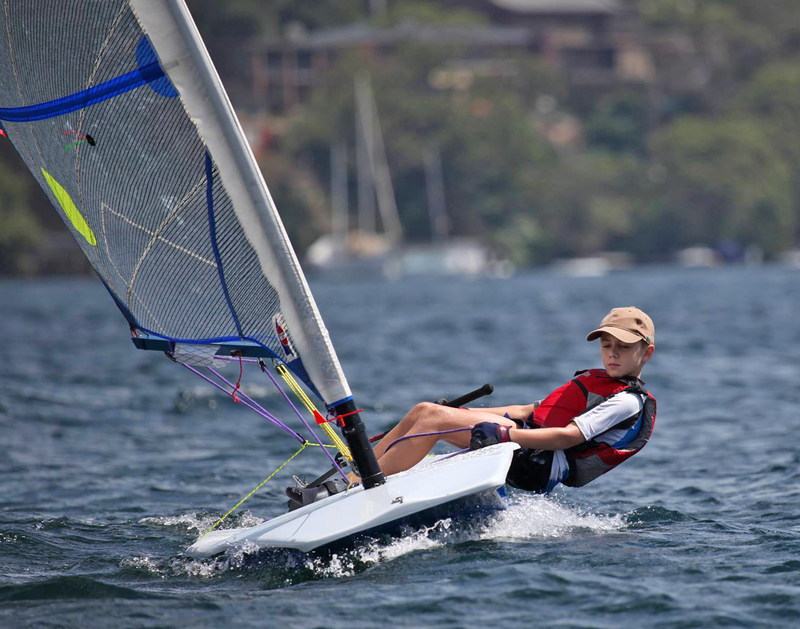 Designed by Willis Reid, the Snowbird remains the only American designed sailing dinghy to be used in the Olympics, selected as the Olympic monotype for the 1932 Los Angeles Olympics. Featuring a V-shaped chine hull, from this angle the Snowbird bow and chine looks similar to the latter designed Danish OK Dinghy, though the Snowbird is a much wider, stable boat than the OK Dinghy. Raced single or two-up in the "Flight" we see, in this photo, a wide range of crews, from juniors, to couples, and all-women. For a 12 foot boat, this is a very big mainsail, well-suited to the lighter airs of Newport Harbor. First person account of the "Flight of the Snowbirds". When the Snowbirds ruled the Harbor. At least I think this is a clinker National 12. 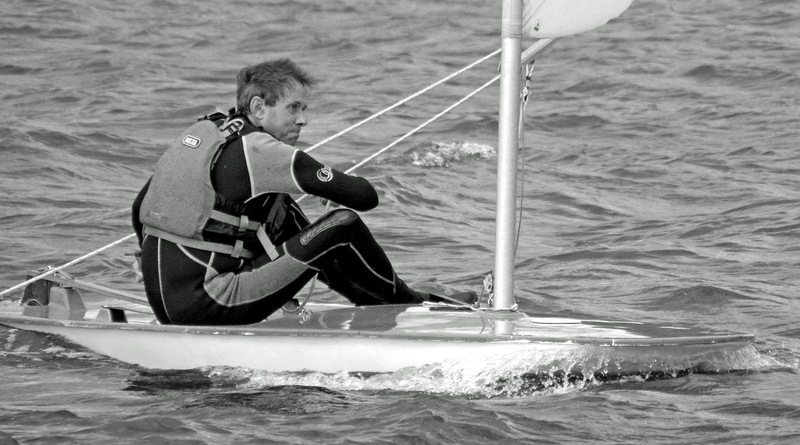 The sailing kit seems typical of English dinghy sailors of the 1960's; short shorts matched with a non-descript woolen sweater (and English sailing waters are generally not warm!). The National 12 is one of two English development classes that have been around since pre-WWII (the other is the International 14). 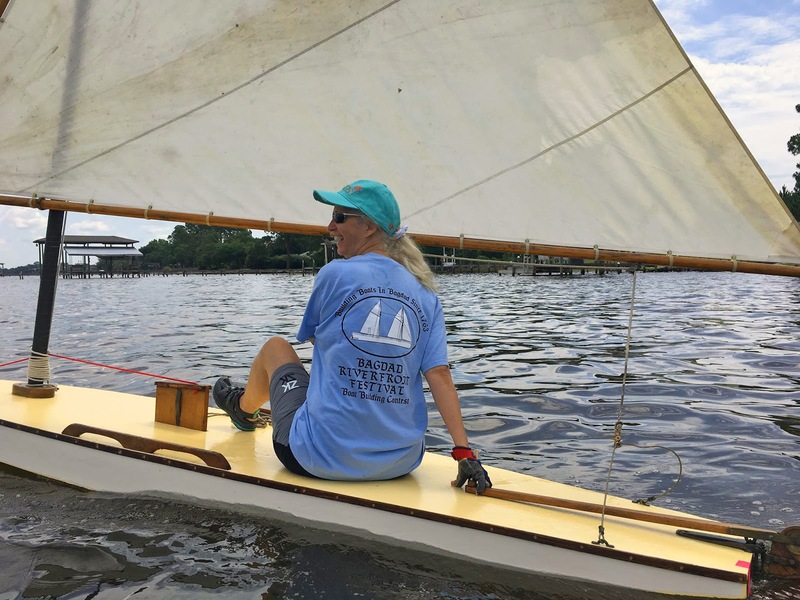 The National 12 is a two-man/woman hiking class without spinnaker. Around 1970 they dropped the clinker construction and now are round-bilged or single/multi chine in hull shape. They are flared wide for hiking power with a narrow waterline, somewhat similar to our Classic Moth Mistral design. (The Mistral is very much a Vee'd shape and the National 12's are not - both, however, are roly-poly.) The latest National 12 designs sport the Bieker rudder wings which fools the stern wave into thinking it has a longer hull going through (an expensive contraption as the rudder mount needs to pivot as well - all adjustable while sailing). The National 12 also appears to be the only class to retain transom sheeting (sheeting off the back of the boat rather than the middle). National 12 Salcombe Open - Race 1 from Tim Laws on Vimeo.